Magazine Wood Luxury B&B01485 750740work Bed & BreakfastThis Country-House style exclusive luxury B&B has been regularly featured in the national press as a very special place to stay. If you want big views, deep peace and a thick slice of luxury up on the North Norfolk coast, then Magazine Wood may well be for you. Pip's boutique B&B sits deep in the country on the family farm, but only a couple of miles back from the coast. Stylish rooms that open onto terraces for long views towards The Wash with gorgeous bathrooms win much praise from guests. Each room is a self-contained suite away from the main house with a super-smart bathroom, a big stylish bedroom, then doors onto a terrace, where you sit for hours gazing out over fields; sunsets are amazing, starry skies on clear nights astound. 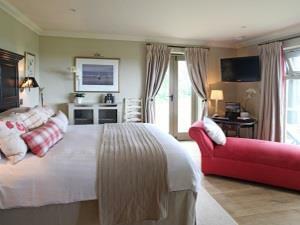 Inside, you find the lap of luxury: contemporary design, chic fabrics, calming colours, the best linen on terrific beds. You get binoculars, a small sofa and a dining table, then tablets for movies on demand, the daily papers and a guide to local restaurants.. You're on the Peddars Way, walks start from the front door. There is a great choice of local beaches to lose yourself on and a great choice local pubs for a good dinner. Named by the Sunday Times as one of Top 100 Places to stay in Britain 2015 & 2016. This Country-House style exclusive luxury B&B has been regularly featured in the national press as a very special place to stay. If you want big views, deep peace and a thick slice of luxury up on the North Norfolk coast, then Magazine Wood may well be for you.